DC Comics is the biggest and best North American comics publisher, featuring a wide variety of characters and genres. Renowned for the World’s Greatest Super Heroes – Superman, Batman, Wonder Woman, Green Lantern, The Flash and many many more – DC has thrilled readers with fantastic tales from the DC UNIVERSE in dozens of languages around the world for decades. Introducing the MARVEL COMICS app, a revolutionary new way to experience the Marvel Universe on your iPhone, iPod Touch and iPad, featuring the world’s most popular super heroes! Download hundreds of comic books featuring your favorite characters -— including Iron Man, Thor, Captain America, Spider-Man, Wolverine and more — on your mobile device with the touch of a button. You’ll experience Marvel’s greatest series and stories like never before, with your choice of guided view (an animated, panel-by-panel path through the comic), or by using regular device controls to zoom and pan your way through pages of sizzling story and amazing artwork! 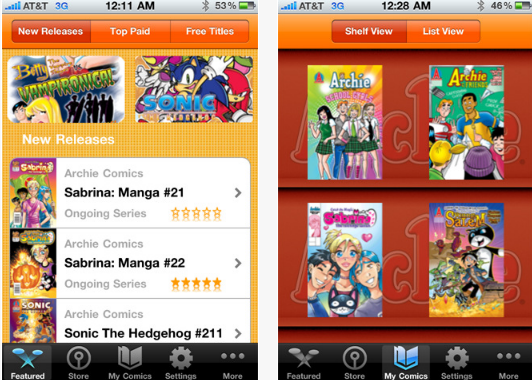 Now you can get all your Archie Comics in ONE APPLICATION! Featuring over 50 Archie titles – Archie Comics is a family friendly, safe application, that has some of your favorite characters! Download 4 FREE Archie Comics (Featuring Archie, Chuck Clayton, Sabrina, and Young Salem) – then get more digital comics with new releases all the time! Archie, Betty, Jughead, and more!!! XKCD Comic Reader allows users to view the XKCD webcomic over a cellular (iPhone only) or WiFi network without Safari. The comic title, image, number and mouseover are displayed on the main page of the application in an organized, easy-to-read manner. 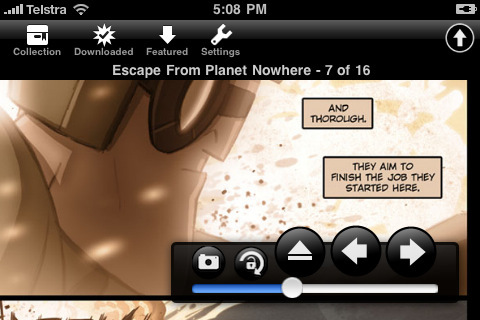 The main page also features navigation buttons to progress forward or backward by one comic, or to jump to the very first or most recently added comic. Shaking the device will display a random comic. 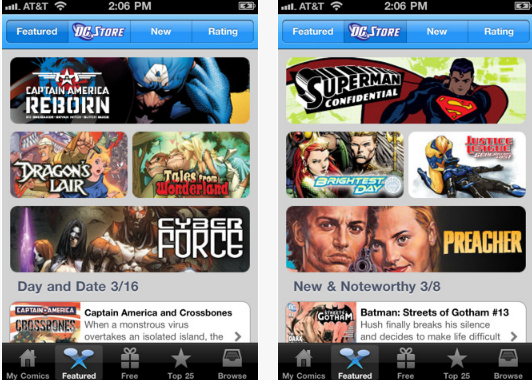 The only iPhone/iPad comic platform that has Marvel, DC and The Walking Dead. Purchases made can be read on the web, too, at comics.comixology.com! ACCEPT NO IMITATION! The largest comic library and store with Guided View™ Technology, which Wired.com says “solves the problem of reading comics on the small screen.” With over 5,000 comics! Featured on Jimmy Kimmel, CNN, and more! More than 300 free comics in app. You haven’t experienced comics like this before – with genres from superhero to “slice of life” to horror, everyone can find a comic they’ll enjoy. Imagine holding your comic library in your hands; with Comic Zeal, you don’t have to imagine. MINI VERSION: This version is for iPhone and iPod Touch only. The regular version works on the iPad too. – Organize your comics by series, don’t look through hundreds to find the one you want. – Show you large covers, they’ll tell you more than a title. – Make it easy to move between issues when reading, you’ll go through a few in a sitting. – Reliably zoom in on content, not show you the same borders page after page. – Be smart about what to show you when you rotate the device, many comics have a mixture of portrait and landscape pages. – Load big images fast, you don’t want to spend five seconds waiting for a page to load. – Load your comics using USB, wifi or even from other applications that support file associations. That app is Comic Zeal. It does everything on the list and much more. 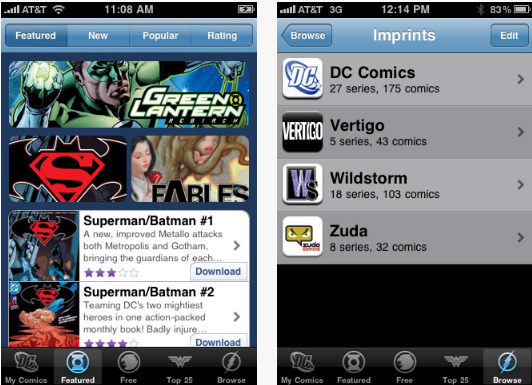 It was the first comic reader on the app store more than two years ago. We’ve been listening to your feedback and improving on it ever since.